Our apple tree has flowered, and dropped, and I'm hoping that this year will be a better year for apples than last year. 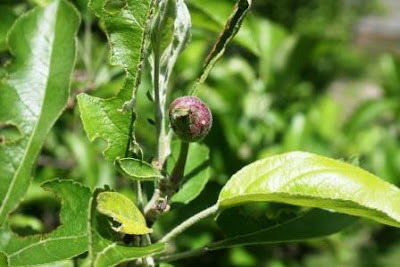 We had a rather piddly harvest last fall, mostly because caterpillars demolished our apple trees in the early spring. This year it appears someone has been munching on leaves, but the teeny little wannabe apples look okay, so far. I'm not totally off topic here, because it does tie in with apples, but recently I was reading a book by Louise Erdrich called The Painted Drum. It was interesting and beautifully written, and I found this passage that I loved so dearly that I read it over and over. It gave me pause. The words ebbed and flowed through me like soothing tides. I wanted to share it with you. Life will break you. Nobody can protect you from that, and living alone won't either, for solitude will break you with its yearning. You have to love. You have to feel. It is the reason you are here on earth. You are here to risk your heart. You are here to be swallowed up. And when it happens that you are broken, or betrayed, or left, or hurt, or death brushes near, let yourself sit by an apple tree and listen to the apples falling all around you in heaps, wasting their sweetness. Tell yourself that you tasted as many as you could. Go ahead. Read it again. I did. I read it over and over. Each time I read it, it seemed to grow more poignant. This fall? I'm going to sit by the apple tree and taste as many as I can. It's Rural Thursday folks! Time for you to link up with myself and Nancy from A Rural Journal. We'd love to read your stories of the rural life (even if you're only dreaming of living one). Grab the code from below the button and paste it into your blog post. Then come back and link up your blog post in the linky. Please make sure to visit at least 5 of the other participants' blogs and leave them some comment love. Can't wait to read your posts! Wow, what a beautiful sentiment! Here's to an abundant harvest! I love the quote. I think I will need to read it again and again to get all that it is saying. That is so true. I can relate to it so much. Thank you, Lisa. I can tell you when our apple tree was standing I let a lot more go to waste then I tasted. Since losing mom I have learned that time is so precious. To do and be the most with what you have been given. oh that baby apple is so cute and i love that passage you chose! I haven't yet read this.... sounds like something I need to read. Your apples look like they might do okay. We had such a late winter storm here that I am not sure how our apples fared in Pa. Interesting post this morning, Lisa. love the quote! so very true. i am going to put this on my to-read list. Can't wait to see the fruits of your labor on your apple tree. That passage gave me goosebumps! I read it. read it again. and again. This is something I'll save to post where I can read this daily. My heart has been hurting lately an this touched me. Thank you for sharing! like the quote, but in keeping with "Everything I Need to Know I learned in Kindergarten," it sounds like another version of one of my favorites, "The Velveteen Rabbit." Sounds like a good book. And, I bet you have apples a-plenty! Yup, I agree, that is a powerful passage you quoted. I'll have to put that book on my reading list. SO jealous! I wish we had an apple tree! How fun for your boys to be able to pick them. My kids would love that. i have read that quote before. and it resonated with me, too. ooohhh lisa, i read it over and over. i printed it out, to give to my mom. my dad passed recently!! i have heard that fruit trees have one good year, then one bad, always that cycle. it's the same with trees that flower, anyway, that's what i've heard!! Do you spray your trees? Just curious. She's a lush writer, don't you think? I'm not kidding, when I got to the last part...I literally have big chills all up my neck and arms, and now have tears in my eyes. Thanks. Oh Lisa - THANK YOU for sharing that today! Later, when I am done with chores, I will sit and admire my apple tree and your lovely passage with be with me. We planted a mini-orchard when we moved here (Missouri). We had a very large orchard in Ohio. Our apples are not producing :-( We've had peaches and nectarines, but the apples are giving us fits! A beautiful passage, Lisa. I could relate to it. I love the image of sitting by the apple tree and the apples dropping in heaps. So much sweetness in nature and in life . . . thank you for sharing this! I hope your apples do well this year. It's amazing the number of lessons we can learn from nature around us. Beautiful quote. What a beautiful passage! I love it, thank you for sharing. I always feel like I find these things at the right times. What a beautiful passage Miss Lisa. Thanks for remind us to live to the max baby!!! Those are some very beautiful words and something to give great thought to Lisa! Thanks for sharing! I hope you get lots and lots of apples this year! Love this post, Lisa. When thinking about an apple tree and all of the apples falling off----we are supposed to taste the apples, try new things, experience life---taste as much of life as we can!!!! Love it! What a beautiful and thought provoking sentiment- thanks for sharing! Hope the bugs leave your tree alone this year. I read it again and again too-it's so beautiful and true! We had one very small apple tree in the backyard when we moved here and between the deer, the gypsy moths and our dogs, the bark was stripped and it died. Sure did love it's blossoms in the springtime. I love,love that excerpt! It means so much to me at this point in my life. Thank you very much for sharing it.